OAKLAND — The life history of the man who confessed to killing journalist Chauncey Bailey won’t be used as evidence to explain his behavior and willingness to join the former Your Black Muslim Bakery, a judge ruled Tuesday. 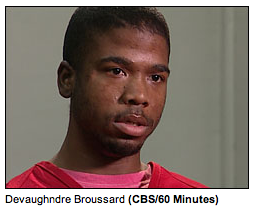 Prosecutor Melissa Krum argued that Devaughndre Broussard’s background growing up in institutions and in foster care while his mother served prison terms was relevant to show he was susceptible to following former bakery leader Yusuf Bey IV and carrying out his alleged orders to kill people. Judge Thomas Reardon denied the request. “I’m not sure the relevance is anything more than marginal,” he said. His decision came after the triple-murder trial of Bey IV and bakery member Antoine Mackey was delayed until Monday after an alternate juror fell ill. Court is closed Thursday for Cesar Chavez Day and the trial is not conducted Fridays. Broussard has pleaded guilty to killing Oakland Post Editor Bailey and another man, Odell Roberson, and has said Bey IV ordered the slayings. Mackey is charged with helping Broussard in those killings and also with killing a third man, Michael Wills. When the trial resumes, Broussard is expected to describe how he killed Bailey the morning of Aug. 2, 2007. Broussard will be sentenced to 25 years in exchange for his testimony. In a motion before the judge after the delay was announced, Krum said she wanted to question Broussard about his life for 10 or 15 minutes to show how he “bounced around” institutions during his childhood, developed a severe stutter and came to seek what the bakery offered people with few other options in life. The bakery, founded by Bey IV’s father, was known as a black empowerment organization in Oakland. Defense lawyers Gene Peretti and Gary Sirbu said the proposed testimony was unfair to their clients. Reardon said his decision also limits the amount of documentation the defense will receive concerning Broussard’s juvenile history in courts and institutions. After debating the matter with Reardon, who is reviewing those records, Sirbu agreed to accept a limited number of documents showing when Broussard was untruthful or deceptive to authorities. Sirbu wants such records to attack Broussard’s credibility. He and Peretti have described Broussard as a serial liar and are looking for further evidence. Krum did win a second motion: Reardon agreed that she could show jurors a videotape of bakery followers performing a militarylike drill as Bey IV commanded them. The members in the 2007 video include Broussard and Mackey. Krum said the video showed Bey IV giving orders and others following them. Broussard has testified that performing such drills was central to the bakery’s culture. Sirbu raised a vigorous counter argument.